Fantastic 56th place at Oringen World Cup! Ok so not my best day.... bit hard to motivate myself after Sunday and long travelling day yesterday, but it is beautiful up in Sälen running in the fjälls. Tough course, but I am looking forward to tomorrows long distance. Yeah baby - World Champion! What an amazing day of orienteering! 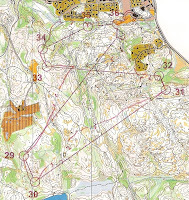 My third attempt at the middle distance at WOC, I finally qualified for the final which was a nice start. I had a good race, my only time loss was a safe route choice to the 3rd control. I was 1 minute behind the best on that control. I finished 2 minutes behind the winner of my heat in 8th place. The final we suspected was going to have something special, and that was proved right as soon as I picked up the map at the start. I reverted to point to point navigation, and I was doing really well for the first 8 controls. I caught Tsvetkov up 6 minutes at number 4 which was a nice boost, although I lost him at number 7 already. Number 9 I just lost contact slightly, and had to go almost out to the ride to relocate. 1 minute lost, but almost acceptable in that detail. Then we left the rock labyrinth and entered the more familiar stuff. I identified immediately that 13 was going to be possibly the hardest control on the course, and then read everything along the slope until I got to the green - then at the last minute as I plunged in, I misread the clearing before the green, thinking I was just below the wrong one, and hence 50m too high up the slope. Nice little parallel error in the green/white veg changes, then out to the ride to relocate. 2 minutes lost. After that stormed round, maybe lost 10 seconds at 22, but otherwise really pleased. A quick split analysis shows that I dropped from 11th to 27th at number 9, and then down to 36th at number 13. I managed to climb back up to number 26, including 5 places from the spectator control to the finish, and 2 of those on the run-in! On a really tricky course, I nailed 23 of the controls, lost 10 seconds on 2, and then had 2 bigger mistakes which really punished me. Physically I was really happy, and my best splits were mostly in the last loop, so there are a lot of positives even if the result is not quite as good as I would have liked. 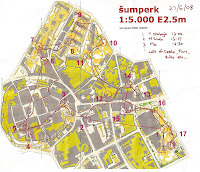 WOC sprint final, 22nd place. Very disappointing performance and result. I didn't feel great warming up - legs felt a bit heavy from the morning and felt a bit tired and lethargic. Warmed up well and tried to get myself worked up. Guess I was slightly worried about the will there be a thunderstorm / won't there. I decided there wouldn't be and put on my racing flats. The thunderstorm hit me at number 2 and continued nicely for the majority of my race, including all 8 'technical' controls in the gardens. Picked the correct route to the first control. but I was obviously off the pace immediately, losing 14 seconds to the best. Started well in the gardens though, and when the heavens opened I was doing ok. Got a bit stressed coming out of number 4 and made a rushed panicy decision to go up and over which was a big mistake. Started to get a bit flustered but managed to calm myself down. Ran ok through to number 10, but I picked the wrong (longest but simplest) route choice to 11. 12 - 14 was simple, but I lost a few seconds on 14 on running speed. 15 I had planned, but then coming out af 14 I started to rush a bit, and bananad big style. Corrected myself, but that combined with the less good route choice anyway cost me at least 10 seconds and probable around 7-8 places. Dammit. I let the storm over - affect me. The lack of grip was a problem, but it seems like my running speed in the technical part was ok - lost a little time running on the longer legs. Need to think about recovery and refueling between two races in a day a bit more, especially before Thursday. Summary- I was definitely one of the worst hit by the weather, but I should have dealt with it better. Very frustrating performance and result, but on the plus side, it is really positive that I consider 22nd a disastrous days work at the World Championships. The qualification was basically perfect, and I had the potential to take a place on the podium or even the bronze on the day with a good performance. WOC got off to a good start for me this morning with the sprint qualifier. I had an early start, and finished 5th in my heat - 14 seconds behind the winner Lubina. Looking at the splits, I lost 10 seconds on the 13th, and 5 seconds on the 14th controls. This is probably because I chose to cross the fence at the crossing points rather than climb it - it was pretty high for a short - arse like me! Apart from those 2 controls my speed was good enough to win the heat, so that is a good confidence boost for this afternoon. 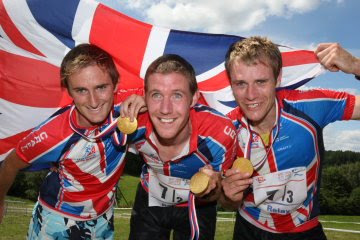 Last night the GB team arrived in Olomouc, Czech, for the 2008 World Championships. The excitement starts on Sunday with the sprint, the middle is on Thursday, the long and the relay next weekend. I am running sprint, middle and relay. After some really bad middle distance results in World Cup recently, I finally had a decent race. No big mistakes, just a couple of small errors in the circle gave me 16th place, which was my best middle distance result since the World Cup Final in France when I was 15th. The long distance was a bit manic, chasing start based on the middle distance results. I had a long line of people to chase to start with, and I managed to catch a few places by the butterfly. Unfortunately I made a 2min mistake at number 8, and then another big mistake at number 17, and after that I ran the rest of the race in the pack of runners from position 13-20th. On the way to 31 I started getting cramps in my hamstring, so I had to slow down, and I couldn't fight with the rest of the pack. I managed to just stay in front of the next runners so I finished 20th. After O-Fest it was off to Czech for the final WOC preparations. 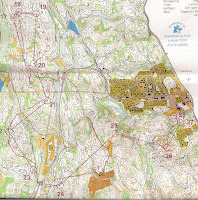 We took part in the Swedish long distance test race (but I didn't run), and also the Finnish and Czech sprint and middle test races (maps below). I had a really good race in the sprint (beating all the Finns), behind only Dlabaja and Smola, but the middle race was a bit of a disaster. Really cool technical area, I managed to make 2 big mistakes - one 5 minutes! Can't remember the last time I made such a big mistake. Now I am back in Stockholm for 2 weeks before WOC.